Come stay at ‘Bout Time and have the time of your life! See our beautiful lake and all the carved waterfalls, enjoy our marvelous wineries and restaurants. Take a thrill ride at the Watkins Glen International Raceway or relax and spend your time here. 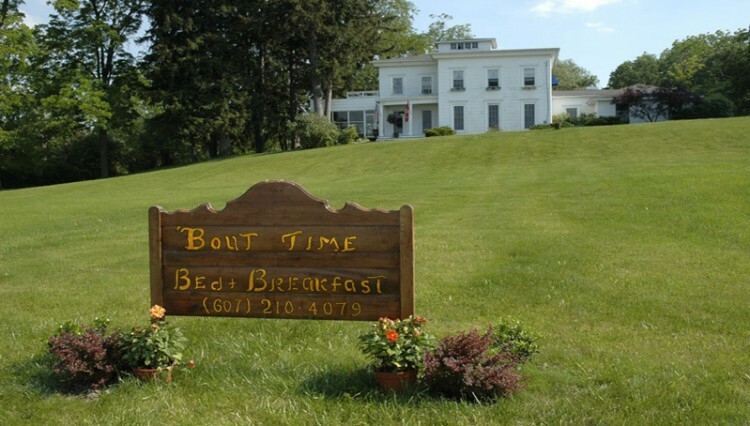 We have four guest rooms an outdoor spa and pool, horseshoe pits and board games to choose from or go back in time and take a balloon ride from the front yard. At ‘Bout Time B&B it’s all about your time! We invite you to enjoy the varied lodging opportunities available in the SCLTA for planning your vacation or return visits. With over 30 lodging properties to choose from, Schuyler (sky-ler) County may well have what you are looking for in a stress-free and relaxing holiday.